What exactly is a ROC? Lutheran Hour Ministries teams up with Lutheran Church--Canada and the LCC's National Youth Gathering to celebrate the 25th anniversary of Lutheran Church--Canada at ROC-Winnipeg! This celebratory event is full of inspiring presentations, hands-on outreach projects, awesome worship music, and loads of practical tools that will transform the way you live as a witness and how you think about outreach! The Lutheran Church Canada's 25th-anniversary celebration worship service Sunday morning, and more! While in Winnipeg be sure to visit The Forks, Winnipeg's number-one tourist destination for dining, shopping and live entertainment. 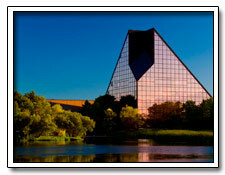 Also available is St. Boniface Cathedral in the French heritage part of Winnipeg, or a walk to the Winnipeg Art Gallery, which boasts the world's largest public collection of contemporary Inuit art. The Assiniboine Park Zoo is home to more than 400 species of animals from all over the world, and the Western Canada Aviation Museum has fun for the whole family, housing an interactive play area for kids aged 2-12. Come celebrate the Lord's work with our neighbor to the north at our Canadian ROC! �2013 Lutheran Hour Ministries, All rights reserved.